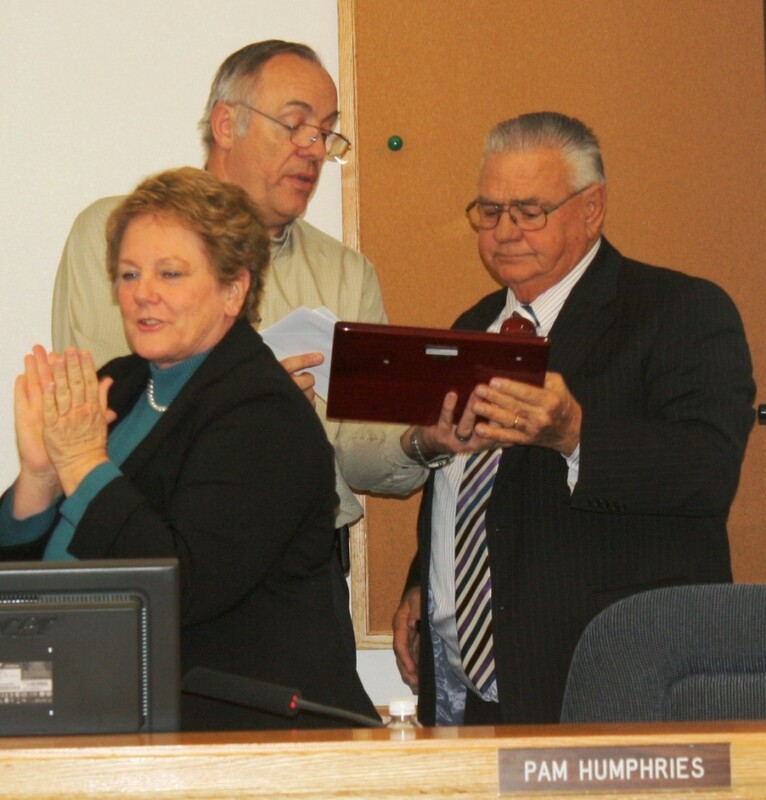 HURRICANE – Thursday evening Mayor Tom Hirschi sounded the gavel to end his last City Council meeting, an emotional affair which was mostly spent interviewing candidates to fill Mayor-elect John Bramall’s City Council seat and discussing an adjustment to the city’s impact fees. Bramall was the lead voice in the discussion about impact fees, saying they need to be reviewed to make sure they are fair and reasonable, especially the recreation impact fee. The city’s current parks plan, which the recreation impact fee helps fund, is probably double what it should be, he said, and current sewer and water conservancy district fees were set when land was anywhere between $50,000-$100,000 per acre. Councilman Darin Thomas said that instead of adding more parks with the recreation impact fee funds, the city could add more to its existing parks, including more pickleball courts and a skatepark. After the brief impact fee discussion, the next agenda item was City Council candidate interviews. 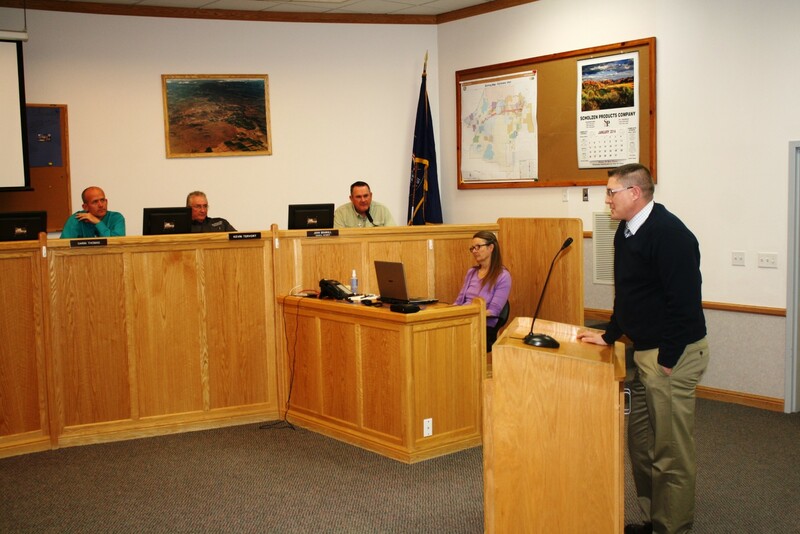 After Bramall and City Councilman-elect Darin Larson (who will fill Mike Jensen’s seat) are sworn in on Monday, the council will decide who will serve the remaining two years of Bramall’s City Council term. They have nine candidates to choose from: Ryan Cashin, Eddie Campbell, Ethelyn Humphries, Patti Lichfield, Ken Mangelson, Dean McNeill, Jason Smith, Jeremy Stover, and Richard Howard, who was unable to attend the meeting. Each candidate had two minutes to tell about themselves. After their introduction, they answered a few questions from the mayor and council. Cashin, current chair of the planning and zoning commission, said he has no agenda and no ax to grind if chosen to fill the City Council seat and that he would make decisions based on the needs of the city’s citizens. He said he would also like to see impact fees reviewed and that he would ensure the city did not go over budget. Public safety would be a top priority for Campbell, who has run for City Council before. He too would like to review impact fees, saying younger home buyers need to be able to comfortably get into the housing market and that the fees could be cut without undue stress. He said he has 24 years of budgetary experience and would always have the community at heart. A council candidate in the last election and a former member of the council, Humphries said she felt her first order of business in the interview was to assure the council she is capable of doing the job. “I’m very healthy,” Humphries said. “I’m just mobility impaired,” referring to the motorized wheelchair she gets around in. The city is in pretty good shape, Humphries said. She mentioned she would like to inspire more people to get involved in city government and that some of her strengths are her previous service on the council and her work as the LaVerkin City recorder. Admitting that she has only lived in the area six years, Lichfield said she would bring fresh ideas to the table and is a progressive thinker, having traveled around the world. She said she is passionate about whatever she gets involved in and would like to see Hurricane well maintained. Mangelson said he would like to serve because he wants to give back to the community. Working as a civil engineer during his career, he said he is a problem solver. He highlighted his experience working with water resources, having worked with the Bureau of Reclamation 12 years. McNeill focused on his previous local government experience, including serving on the planning commission, power board and airport board. If chosen, McNeill said he would be forward-thinking on how the city should grow, taking into account things that could impede growth in some areas, such as collapsible soil. A former mayoral candidate who ran against Hirschi in 2009, Jason Smith said his top priority if he lands the seat is to see the character of the city maintained, mentioning that the city needs to capitalize on tourism. “We’re kind of immune to how beautiful this place is,” Smith said. Stover said he wants to be involved for the long haul and that he would look forward to the association with the members on the council and the ability to learn from them. He wants to ensure Hurricane does not lose residents or money to St. George, Stover said. Like Humphries, he would like to see more involvement from the city’s citizens. In other business, the council approved the final plat of Redstone Springs, a 21-lot subdivision at approximately 2250 South 3400 West with the caveat that it be occasionally checked to ensure no rocks would fall on any of the future properties, specifically citing the rockfall in Rockville that destroyed a house a few weeks ago. 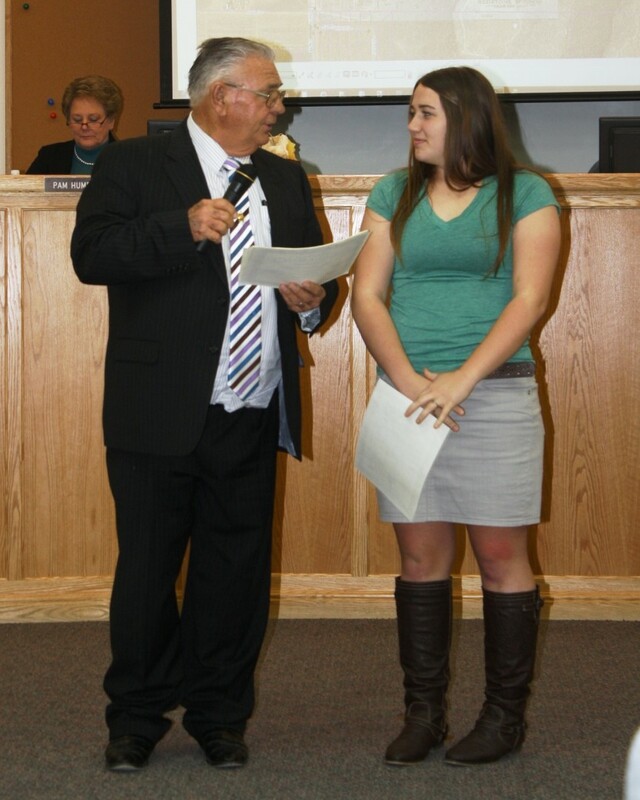 Before any of the meeting’s regular business, Hirschi presented certificates of excellence to a handful of Hurricane High School female athletes for achieving all-state and academic all-state honors. 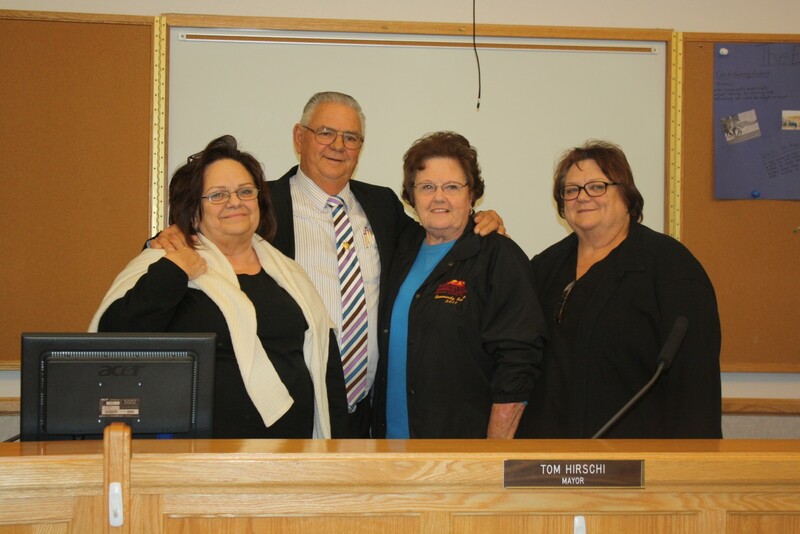 Additionally City Manager Clark Fawcett presented Hirschi and Jensen with plaques commemorating their service to the community, reminiscing about his time with Hirschi. “I don’t know anybody who loves Hurricane as much as Tom,” Fawcett said, adding that Hirschi put his “heart and soul” into his mayoral duties. After receiving the award, Hirschi held back tears as he too reminisced and thanked the council and city employees for their time and effort. “Our staff are wonderful people,” he said. NOTE: Bramall announced during the meeting that a blood drive will be held on Jan. 11 at either the Hurricane West or Hurricane stake center buildings, of the Church of Jesus Christ of Latter-day Saints, for Brian Scott, a former Hurricane High School football and wrestling standout who is fighting leukemia.